I am pretty new with stresstimulus, but i have really liked this tool for easiness and simplicity. What i was needing is to hit a URL for load testing definite number of times with several users. I made a simple php page to test. It writes a line with timestamp in a text file during form submit. I recorded the post request for posting the form used number of virtual users 25, and iteration 30. I can see that after running the test I see around 30 lines in the text file but NOT exactly 30 always. As I had only one request as recorded test case I see the test report Total requests: 30, where as there is 29 entries in the output file. But my concern is that are those 25 users are requesting parallel? In that case what does this iteration working for here? My objective was to hit the recorded request 25 * 30 times concurrently. How can I do so? Another favor I want is that, I have to hit a request several times for load testing. But it requires a user authentication therefore I think there is a session ID. Problem is that I cannot record the authentication and run it as test case. So how can I create this test case so that I can do a manual login but then run the test to hit the URL thru stresstimuls? 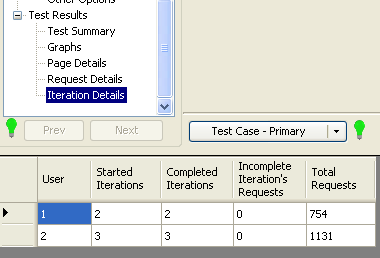 To run 25 * 30 iterations you need to set 25 users and 750 iterations in the “Number of Iterations” box, as it allows entering the combined number of iterations performed by all users. This however does not guarantee that every user will run even number of iterations. In the new version v0.9 that is coming this week we added an Iteration Details grid that shows breakdown of iterations between VUs. The alpha of this version is available here. The number of Iterations should be replayed exactly. When you compare the number of entries in your log file with test settings, compare it also with Test Summary report (it shows number of Iterations started and completed) and the number of sessions in Fiddler. Hope this will help to determine where the discrepancy is. On authentication: When you are saying that you cannot record the authentication and run it as test case, what do you really mean? While I do not know the authentication that your site is using, you should be able to record navigation through the login process in StresStimulus, so your test case will store user credentials. When run the test you can use the same credential for all users or use a *.csv file, which is storing multiple user name / passwords pairs, and data bind them to a login page request parameters in the Parameterization section. Hi thanx for the reply. 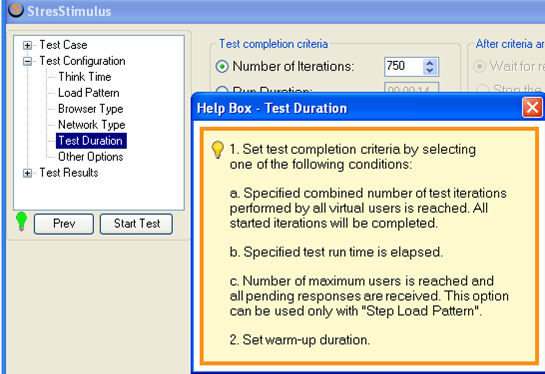 I have seen that we can record authentication steps as well for load testing. But my objective is to hit a URL concurrently several times. And this URL can only be hit if u r a logged in user. So if i include log in step as a test case it will not be a proper test because my target is to hit the specific URL in a time frame. So is it possible to load test on a specific URL(s) among the test case URL? Or like run some test cases for once as a prerequisite and then the follow up test case requests will be countable for load testing? ...my objective is to hit a URL concurrently several times. And this URL can only be hit if u r a logged in user. So if i include log in step as a test case it will not be a proper test because my target is to hit the specific URL in a time frame. Why can’t you record a test case that stores (a) a login request with credentials followed by a (b) requests to your test page, and then replay this test case with multiple VUs? In the load test, every VU will first log-in (concurrently) and then issue requests to the test page (concurrently, as well). If you care only about your test page metrics, you can use data from the Page Detail grid just for this page. You can set the necessary number of VUs to create necessary request per sec load. Will this work for you? So is it possible to load test on a specific URL(s) among the test case URL? It sounds like “Loop functionality”. StresStimulus does not support loops yet. However, loops provide requests sequentially, not concurrently, while multiple VUs are truly concurrent. Or like run some test cases for once as a prerequisite and then the follow up test case requests will be countable for load testing? StresStimulus does not support initialize test yet. aah.. thanx... if every VU will first log-in (concurrently) and then issue requests to the test page (concurrently, as well) that's great, that should do for me.